Shirts With Random Triangles: Which Teams Will Compete In The 2016 Cactus Bowl? Action from 2015 Cactus Bowl. Image via Pac-12-com. 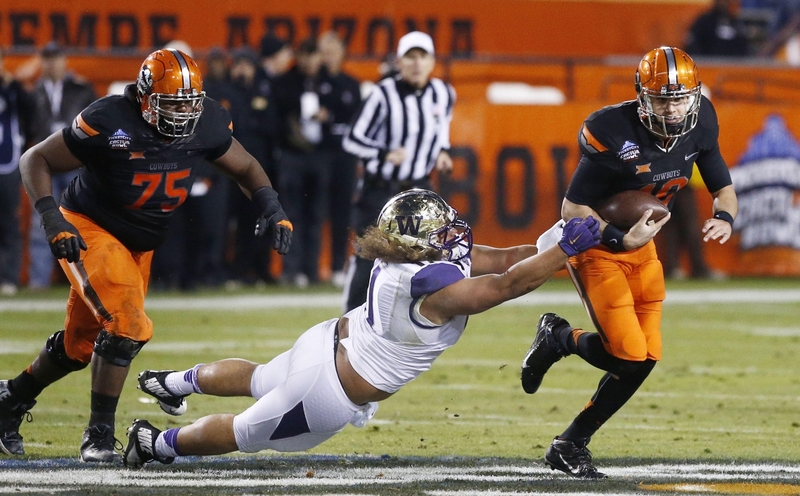 Which teams do college football's best prognosticators believe will be selected for the 2016 Cactus Bowl? The Arizona-based bowl has a bounty of candidates from the Pac-12 this season, but a possible lack of enough bowl eligible Big 12 may find it having to look elsewhere to find the Pac-12's opponent. West Virginia vs. Arizona St.
Cal and Arizona St. look to be the most popular picks to represent the Pac-12 among the sampled analysts. Kansas St. and West Virginia are the popular picks for the Big 12's representative. Mountain West members Air Force, Nevada, and New Mexico get nods from the analysts who don't think there will be enough bowl eligible teams coming out of the Big 12.